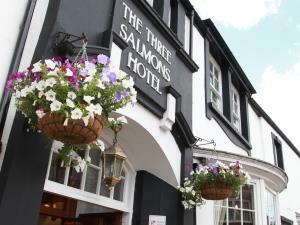 Restaurant at The 3 Salmons at Three Salmons Hotel01291 672133work RestaurantOur Head Chef, Albert Pronin, is a highly experienced executive chef who has spent almost 20 years working within hotels, restaurants, banquet and al a carte operations throughout the UK. Since moving to Wales from London with his family in 2014, Albert’s goal was to join the Three Salmons team and even chose the hotel as his wedding venue last year! Albert brings his creative talent and desire to produce innovative dishes using the freshest possible ingredients to The Three Salmons and looks forward to leading his team to create the finest seasonal dishes in the area. To complete your dining experience the Three Salmons offers a comprehensive wine list including a hand-selected array of new and old world wines. As our menu changes with the seasons so does our cellar to ensure there is always a superb wine to compliment your chosen dish. For those who would like to try something a little more homely the Three Salmons offers a selection of locally produced real ales and ciders, and food from our restaurant menu, is also served in the bar in a more informal atmosphere.